We’ve now hit on two very different myths about where karate belts came from. They didn’t come from not washing belts, and they weren’t invented for lazy Americans. So where did they come from? We must recognize that what came first wasn’t the belts, it was the kyu/dan ranking system that the belts represent. This ranking system isn’t unique to the martial arts. 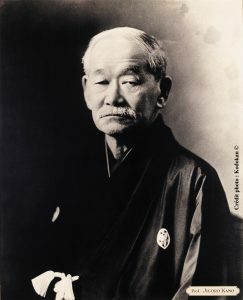 Jigoro Kano, the founder of Judo, brought it to Judo in 1883. From there, it spread throughout the rest of the Asian martial arts. But Kano didn’t invent the system. He borrowed it. The system is used in several competitive sports in Japan, but the most famous is the game of Go. The purpose of the ranking system is to match competitors against opponents of comparable skill. That’s exactly why Kano borrowed it. When he transformed the ancient martial art of jujitsu into the competitive sport we know today as Judo, he needed match judoka into reasonably fair groups. The kyu/dan ranking system provided it. Kyu ranks begin with a higher number – usually in the five to ten range – and count down toward one as the competitors become more advanced. After the first kyu rank, practitioners then advance to the first dan rank. The dan ranks count up from first dan, usually maxing out somewhere between sixth dan and tenth dan. To us westerners, a good way to think of it is that first kyu would represent a very skilled amateur, while first dan would represent a very beginning professional. That’s far from an entirely accurate picture. The idea of changing money, which westerners associate with the term “professional,” has nothing to do with it. But it kind of gets across the general idea. This system is used fairly commonly in Japanese competitive events. There’s even a particular brand of Japanese flower arrangement that uses the kyu/dan system. We have similar systems in the west, including several different chess rating systems. Kano introduced colored belts into the system when he brought it to Judo. The original Judo belt color scheme consisted of light blue for brand new students at sixth kyu, white for the remaining five kyu ranks, and black for dan ranks. At sixth through eighth dan, practitioners could choose to wear either black or red and white paneled belts. At ninth and tenth dan, practitioners could wear either black or solid red. Gichin Funakoshi again borrowed the kyu/dan ranking system for Shotokan in 1924 when he brought it into the Japanese school systems. From there, the system spread first into other styles of karate and back into Jujitsu, and then outward into many other martial arts. By the late twentieth century it would even spread into Korean and Chinese styles. Many styles – and even many dojos within the same style – adopt their own belt color system, making it nearly impossible to compare belts from different dojos. There are a handful of fairly common color schemes. For instance, very few Japanese schools will use a red belt for a kyu grade. Those usually represent the highest of the dan grades. And schools that do use red for kyu ranks usually use it for first kyu. Even so, there are glaring exceptions from time to time. I’ve made it a habit to ask students transferring from other dojos how long they’ve been training, rather than what color their belt is. It gives a far better picture of the student’s actual skill level. Sensei Russell Newquist has studied karate and jujitsu for more than two decades. He is the owner and operator of Spirit Made Steel Martial Arts.